Several years ago, just as the economy was spiraling, I went through a huge downsizing. I was completely broken up by this, even though I was not one of the ones being let go, but to see how people handled it was amazing. Some were upset and crying. Some were very angry. But some continued to laugh, joke and hug everyone as they packed their desks and headed out. They didn’t miss a step. Some of us had lunch from time to time over the next few years and those people who smiled in the face of the unexpected did very well. Those who didn’t seemed to take longer to find positions, still remained unhappy and angry at the company for letting them go. The ones who accepted the situation and moved on to their next big adventure were the resilient ones. Resilience is the capacity to recover quickly from difficulties. 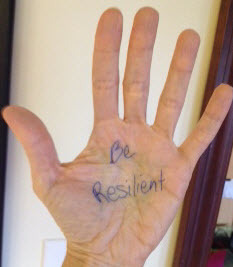 Being resilient helps you bounce back after surgery, illness, loss or anything else life can through at you. A post on Healthgram details some ways to become more resilient, but I’m betting you’re already doing them. If you’re still not sure how resilient you are, give this quiz from Psychology.about.com a try and see how what your results are. Resilient people are positive people. Or maybe vice versa. Either way, you come out of a bad situation positive, and that’s the right mental attitude.